Once upon a time there were two fair maidens residing at the Animal Shelter of Martha’s Vineyard. 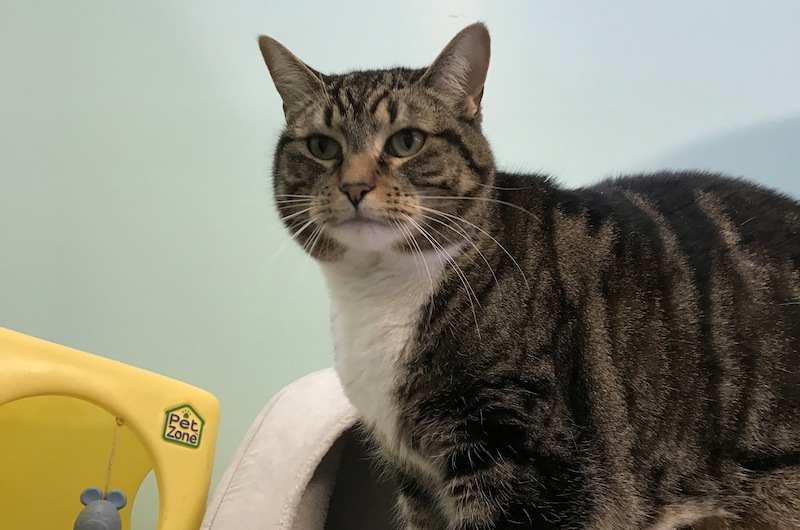 The elder of the two, Tiger Lily, is a five-year old tabby and white feline who is a little on the plump side, but she makes up for that with a delightful personality. And she is a real lover. She is hoping her prince (or someone equivalent) will come to rescue her. 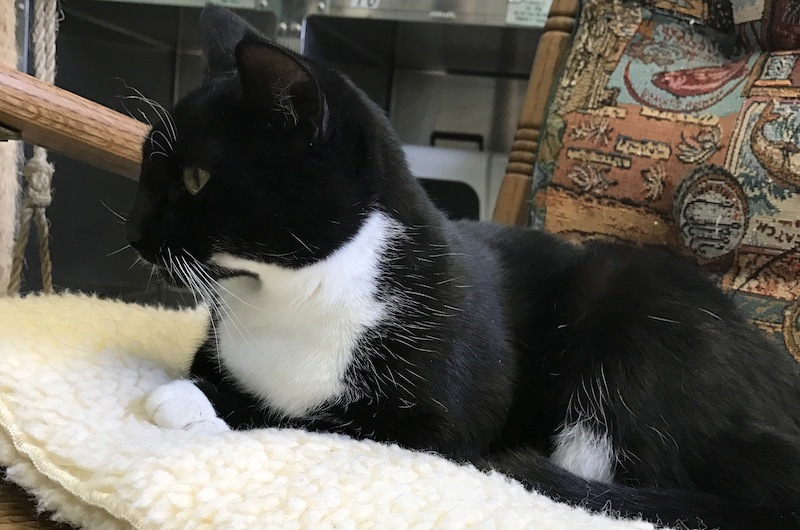 The other young lady, Mary, is a long-legged tuxedo beauty with a petite frame who is only one year old. As befitting a princess she has classic tuxedo markings, and airs as well. She is hoping the special family, or individual, will recognize her uniqueness and sweep her away to a permanent home. There are also two handsome princes, and a king, hunting for better lives. The king of the castle is Chaps. At 11 he has the regality of a king and spends a good deal of his time lounging on his throne. He is white with striking black markings and the calm demeanor befitting a king. The two four-year-old princes are Lefty and Percy. Lefty is a large buff and white cat who spends his time surveying his domain and the grounds outside. He is very friendly and affectionate, loves to play, and needs a castle of his own. He has no objection to sharing that new castle with other pets. The other prince, Percy, is a very handsome gray boy with a charming personality. However he doesn’t always play well with others so would prefer a new environment where he can be the only king in the castle. This is not a fairy tale but the true story of our residents. All are royalty to the staff and volunteers and we hope each one can find their true destiny sooner rather than later. The good news of the week is that Oscar, the Caribbean coconut hound, has found a fabulous a new home, and so has year-old tabby girl Hunter. Some fairy tales do come true. 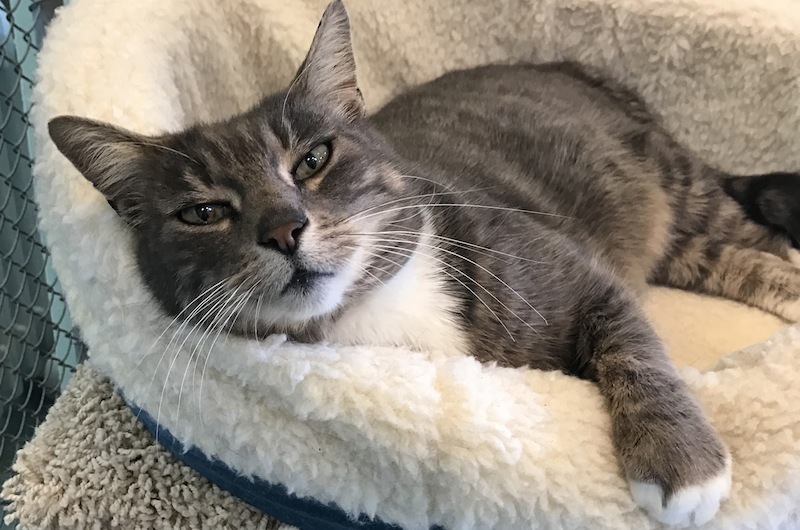 Shelter hours are Tuesdays and Wednesdays, 8:30 a.m. to 2:30 p.m., Thursdays and Fridays, 8:30 a.m. to 6:30 p.m. and Saturdays, 8:30 a.m. to 4:30 p.m. The shelter is closed Sunday and Monday. The telephone number is 508-627-8662. Contributions are always gratefully accepted; the shelter is funded solely by donations. Please make checks out to The Animal Shelter of Martha’s Vineyard; the mailing address is P.O. Box 1829, Edgartown, MA 02539 or visit animalshelterofmv.org.